The "Great Cazenovia Fugitive Slave Law Convention"
Cazenovia had been a center of anti-slavery since the early 1830s and many leaders of the abolitionist movement were born or raised in Cazenovia or at one time made Cazenovia their home. Among the most noted figures in the fight to abolish slavery, and the originally parallel campaign for women's rights, who had resided in Cazenovia or were frequent visitors are Samuel J. May, James Caleb Jackson, Luther Myrick, Robert Green Ingersoll, Celia Burleigh and Theodore Dwight Weld. In nearby Peterboro was the home of Gerrit Smith, one of the most active leaders of all. The abolition movement had been active in the region from the mid-1830s. Congregational, or Free Churches, espousing abolition and women's rights, among other principles, had begun to form out of local protestant congregations in the early 1830s. Cazenovia's Congregational / Free Church was founded in 1833 and had many ministers, including a Mr. Pritchett, Dr. Fordyce Rice, Rev. Abram Pryne, Rev. Francis Hawley (son also famous), Luther Myrick and Rev. John Ingersoll. 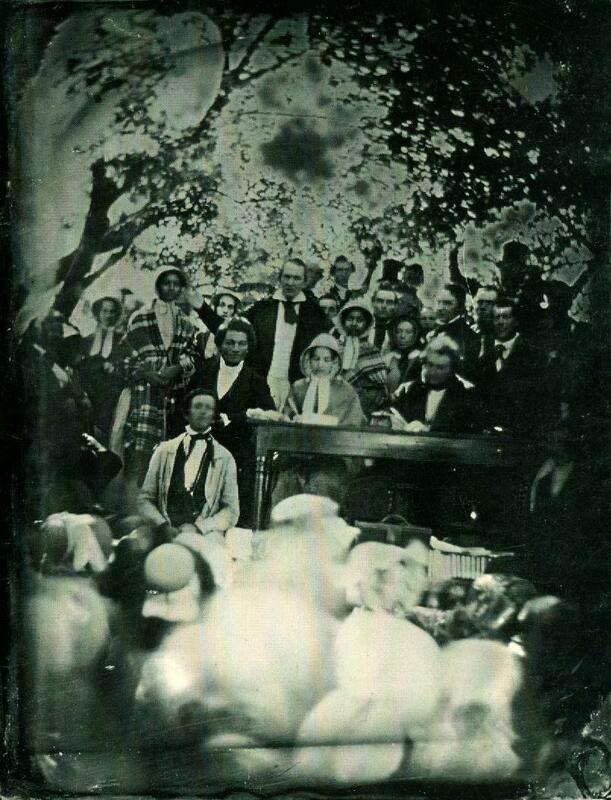 Since they had no regular or established ministers, and the congregation was quite fluid, they often acted as a public speaker's forum and had many renown speakers, including Lucretia Mott, Frederick Douglass, Robert Green Ingersoll and Gerrit Smith. In response to the proposal before congress which became the Fugitive Slave Act of 1850 abolitionists all across the nation were in an uproar. This law, which had a great deal of political backing and was sure to pass (as it did on September 15, 1850) infuriated the abolitionists and northern public alike. The law would require local law officers, even in states where slavery was illegal, to find and arrest all fugitive slaves and return them south to their owners or back into slavery. It also made it illegal for anyone to harbor or aid escaped slaves. The furor over this act and law resulted in many meetings and rallies being held, a surge in conduct of escaped slaves on the "Underground Railroad" and open public disobedience of the laws. One such public outrage at the situation is the famed riot known as the "Jerry Rescue" which occurred in nearby Syracuse, NY, on October 1, 1851. On August 21 and 22, 1850, in the orchard of Grace Wilson's School, located on Sullivan Street in the village of Cazenovia, was held one of the largest and most important of the many abolition meetings. It was estimated that between 2000 and 3000 people came to the Cazenovia Convention, including "a considerable number of escaped slaves," including famed orator Frederick Douglass and the Edmonson sisters. Leading abolitionists and rights activists of the time took the podium and spread their word calling for abolition of slavery. Although the photo has long been known, the event had been forgotten by historians (local and otherwise) and its importance was not fully recognized until I began telling people about it. Eventually, Hugh Humphreys learned of the photo and began to research and write his incredible record of the Convention. His booklet "Great Cazenovia Fugitive Slave Law Convention" can be ordered from the Madison County Historical Society. Today, with an increased interest in abolition and the Underground Railroad, the Cazenovia Convention is becoming world renown, and an event that shook the nation but was then forgotten by all is now becoming part of our story again. Both an original and a copy daguerreotype of the event are known to exist, the original (with reversed image) image is in the collections of the Madison County Historical Society while the copy (with correct positioning) is found in the collections of the Getty Museum. Charles B. Ray = man between Samuel J. May and James Caleb Jackson. Theodore Dwight Weld, brother of Greenleaf Weld, the daguerrean artist who captured this image, is the lopsided man seated off the end of the table. He is considered by many modern historians to be perhaps the greatest of the abolitionist leaders. His facial deformity made him quite shy and he stayed out of the limelight but was hugely influential to all the movement leaders. I was contacted by a researcher, Robert Jackson, a few years ago and by comparing notes and photographs of Weld we came to the conclusion that, although Weld had not been previously identified, he is the one seen beside the table. 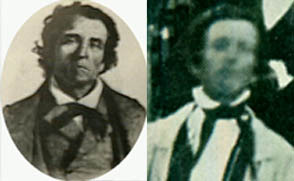 The portrait of Theodore Dwight Weld on the left is from a web page for Bellville, NJ and that on the right is clipped from the Convention image. 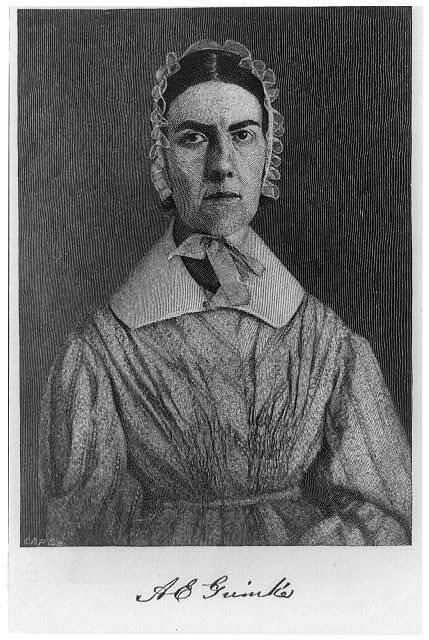 Also perhaps in the image is Well's wife, Angelina Grimke , on of the famed Grimke Sisters. She and Weld were married in 1838, so I suspect she was also at the convention, and may be the woman situated between Samuel J. May and Emily Edmonson.